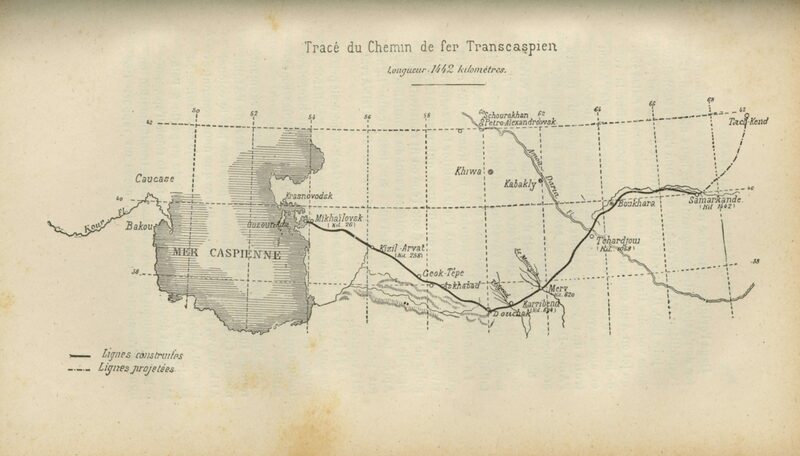 The present travel account was published by Napoléon Ney, the founder and president of the Racing Club in France, after his journey from Paris to Samarkand through Europe, the Caucasus, and Siberia to the inauguration of the Transcaspian railway in Samarkand on the 27th of May in 1888, upon an invitation from the Russian General Annenkoff. This detailed narrative gives a valuable insight into an exciting period when new technologies enabled great changes in the means of travel, at a time when the Russian and British Empires were in constant conflict over regions in Central Asia. After the invention of the steam engine and the onset of railway construction works, Russia eventually started to extend this rapid communication system to Central Asia in an effort to obtain greater economical advantages. The new conditions enabling the transportation of heavy loads at higher speeds than ever before led to faster and closer contacts between people and countries and greater diffusion of ideas and cultural traits. 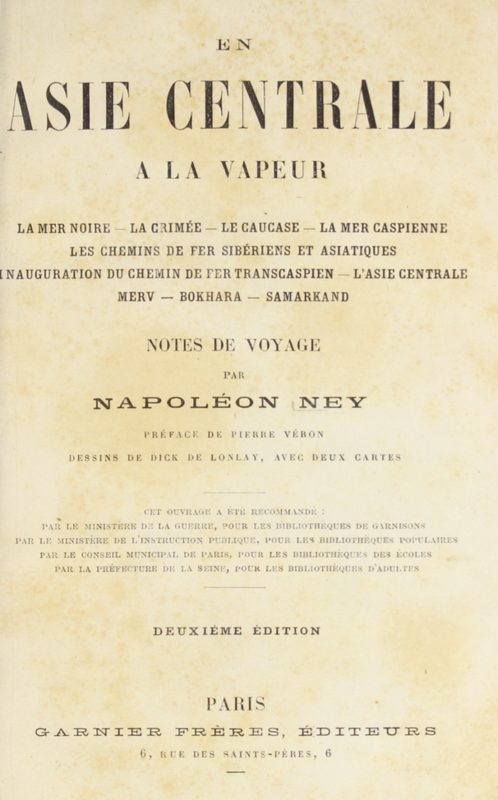 Ney travels from Paris to Odessa and crosses the Black Sea in five days on a Russian steamboat, before reaching Batumi. From the Caucasus he continues across the Caspian Sea and travels by train from Tbilisi, the capital of Transcaucasia, to Baku. Ney gives detailed descriptions of regions and landscapes and he discusses the advantages of the railway connections from a political point of view, considering new possibilities for the military and for trade. The advancements of the steamboat and the railways will not only grant quicker access to distant destinations, he argues, but they will also allow for the transportation of heavy loads in much greater quantities, which was not possible earlier given only camels and horses. Ney also mentions plans for the construction of pipelines between Baku and Batumi, connecting the Caspian Sea with the Black sea. He comments that a train station in Bokhara, one of the most secluded Muslim towns in Central Asia, is indeed the sign of true change. Ney outlines the history of Russian presence in Central Asia during the preceding two centuries and accounts for the events leading up to the formation of Russian Turkestan in 1866 with Tashkent as the capital and General Kauffman as its Governor. The following paragraph reveals a typical view of the time, that civilized nations should teach and protect uncivilized people. In the appendix there is a copy of instructions given by Emperor Napoléon Bonaparte to General Gardane concerning a mission in Persia in 1807. The aim of the mission was to teach European military techniques to the Persians and to secure an entrance for the French to India through Persia, thus challenging British advancements there. On p. 275 there is a large-scale map of Asia and Europe with existing and planned railways marked out. 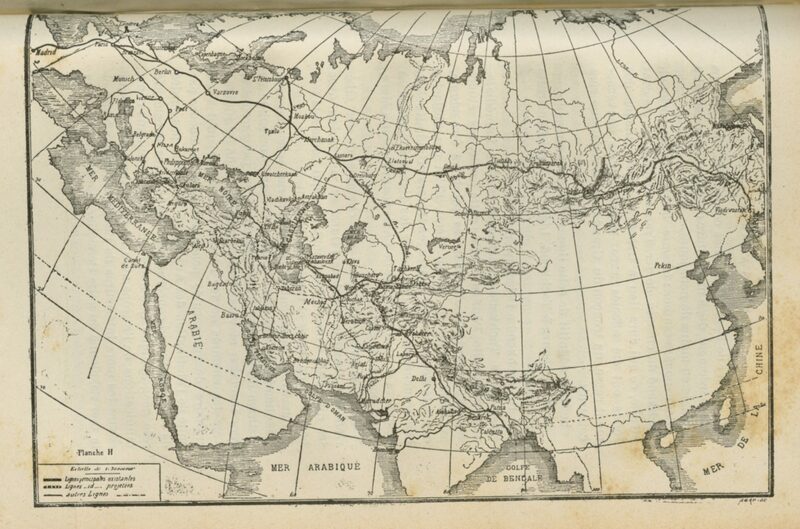 Another map on p. 285 depicts the 1442 km long Transcaspian railway. Additional documents are available throughout the book. A sketch of the double-decker train wagons in use at the time can be found on p. 289. A table on pp. 294-295 gives the distances in versts between stations and supplies information about individual stations, such as the number of inhabitants, villages, and geography. Data on the construction and length of the railway from Uzun-Ada to Samarkand are found on pp. 299 and 303. The year of publication of this books is lacking. However, from the text it becomes evident that the first edition of the book was printed the same year as the travel took place, in 1888. The year of publication for the second edition, which was scanned and made available on this website, is unknown. More information about the author, Napoléon Paul Ney (1849 – 1900) can be found here and here.